The newspapers tell of two young women being murdered and mutilated. M reveals that they had both been part of a covert operation against the Russians, which had ended five years earlier. As someone operates a callous programme of revenge, it's up to Bond to pull out the remaining operatives, and track down the killers. James Bond is back—in his deadliest assignment ever! Brutal murders are occurring with alarming similarities in the English countryside: After two strangled bodies with severed tongues are found near London, James Bond learns from a hasty briefing with “M” that the victims were once members of Operation Cream Cake—double agents against SMERSH, whom he had helped smuggle out of East Germany five years before. But something has gone badly wrong. To save the survivors, who are clearly earmarked for ritual killings, Bond must smoke out the traitor among them. As always here is a catch, but this time M’s own head is on the line and bond must succeed alone, with no help from anyone in the department. This time, as the title suggests, there will be "No deals, Mr. Bond." With little to go on, Bond rescues the beautiful Heather Dare from the same fate as her fellow operatives. Together, in a race against the clock, Bond and Heather slip into Ireland to save the next intended victim, only to realize that they face an even more deadly opponent: Kolya Chernov (code name: Blackfriar), who heads the newly reorganized, newly menacing SMERSH. Jetting to Hong Kong to ferret Chernov out of his lair, a weaponless Bond becomes the quarry of four armed and vicious assassins in a hellish version of "the most dangerous" game. From its slam-bang opening to its breathless climax, No Deals, Mr. Bond is a roller coaster of a read packed with surprising twists, in which people never are who or what the seem—except for the ever infallible James Bond. Top Left: American 1st edition Putnam hardback. Top Right: American 1st edition Charter paperback. Bottom Left: British 1st edition Coronet paperback. Bottom Right: Japanese edition paperback. "Bond nodded curtly and left with as much dignity as his churning stomach would allow." 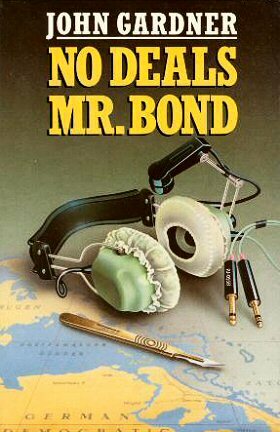 This was author John Gardner's sixth Bond adventure and is often touted as one of his best. The traditional 007 formula, which Gardner would later resent and rebuke with "The Man From Barbarossa", is in full flow here. The UK first edition hardback was the first jacket in the Gardner series not to be designed by Richard Chopping. Gardner, who was living in Ireland at the time and featured as one of the book's locations, dedicated the novel to his dear friend Tony Adamus. Two members of a spy team Bond helped recover from Germany five years ago have been killed in revenge, and M sends Bond to catch up with the three remaining agents and ensure their safety. However, Bond must act unofficially (because one agent is a suspected traitor, and M is facing calls for his resignation over the affair). Bond finds the first agent, Heather Dare, and barely stops her being murdered. They fly to Ireland to find the second agent, Ebbie Heritage, but they are captured by GRU colonel Maxim Smolin, who has Ebbie and claims to be a double-agent working for M. He says the KGB have been tipped off. General Konstantin Chernov (formerly of SMERSH) captures everyone, but Bond and Ebbie escape (and fall in love) and follow Chernov to Hong Kong where the remaining agent, Jungle Baisley is captured along with Bond and Ebbie. Chernov then makes Bond fight for his life in a bizarre gladiatorial contest, but Bond wins through. Chernov is captured, and Heather Dare exposed as the traitor.